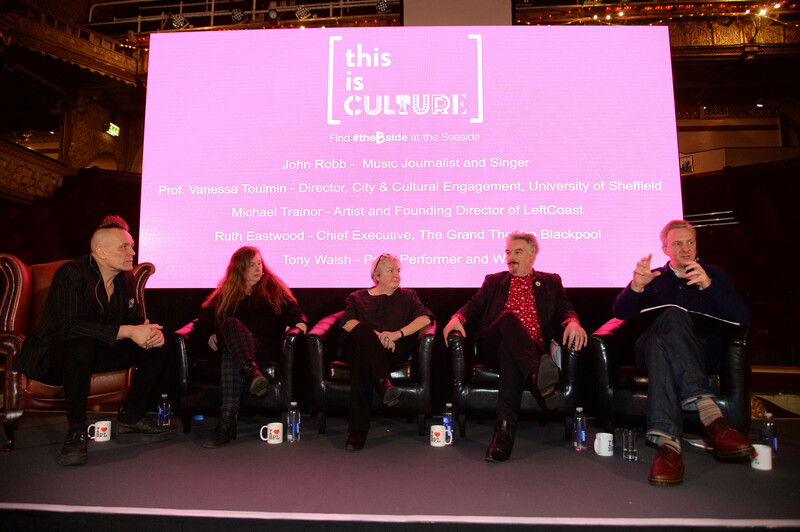 Blackpool is announcing a new CultureBlackpool project to showcase and highlight the cultural offer that currently exists in resort to visitors and residents. CultureBlackpool, a new collaboration between public and private sector partners is launching its B/Side Campaign which aims to flip expected perceptions of Blackpool and persuade people to ‘tune in’, look up and around and to appreciate the cultural side of the resort. The partnership has been formed to promote Blackpool’s back story of architecture, heritage, exhibitions, internationally acclaimed installations and events to its 142,000 residents and 18 million visitors. Supported by movie, theatre, music, art and TV greats such as John Robb, Alfie Boe, Little Boots and lots more, each act will reveal their B/Side and what Blackpool means to them. Legends of the stage including Ken Dodd and critically acclaimed Sir Matthew Bourne have both featured at The Grand Theatre, which was designed by renowned Victorian architect Frank Matcham and there is the Blackpool Winter Gardens, which is one of Europe’s biggest theatre and entertainment complexes and have hosted some of the world’s top entertainers in music and performance. Furthermore, there is an exciting, ever-changing exhibition and events programme at The Grundy Art Gallery which features the best of contemporary art. Here, leading artists like Tracey Emin and Picasso share the platform with emerging talent from the region and beyond. Equally, The Blackpool Tower Circus (one of the most important circus buildings in the world) has been providing spectacular entertainment since 1894 with the original cages holding elephants, tigers and lions still in place beneath the arena (although animals haven’t appeared on the bill since 1990). It is the only surviving Victorian arena still in use today, along with Great Yarmouth Hippodrome and one of four original water circuses still in use in Europe, creating an elaborate water finale to every summer show, just as it did a century ago. LeftCoast, one of the Arts Council’s Creative People and Places Projects, have been working in the resort since 2014. Working with residents and visitors, they make arts and culture accessible whilst still being challenging and specialise in using art to reimagine spaces in new and creative ways. They have brought world-class contemporary art to Blackpool such as contemporary circus company Circa who performed DEPART in Stanley Park and dreamthinkspeak who reimagined ABSENT in Blackpool’s Winter Gardens. Both of these companies are not something you would expect to see outside of an international festival and certainly not in Blackpool. Jobs explains “The ambition of CultureBlackpool is to keep the resort at the forefront of culture with tourists and residents for generations to come by creating a place that has a rich blend of heritage and contemporary culture embedded in its destination strategy”. There are many projects in the pipeline for Blackpool. The exciting ‘A museum’ project to create the town’s first museum will tell the story of the city’s contribution to the UK’s popular culture. The £16m development has been chosen as Lancashire’s bid for the Northern Cultural Regeneration Fund and a decision on this award and a bid to the Heritage Lottery Fund is due in Spring 2018. On the bids being successful, the museum plans to be open for summer 2020. It will be housed in the Palatine Building, a landmark site on the promenade between the Tower and Coral Island which is currently being developed into a 5* hotel and leisure complex. The latest campaign complements the £250m transformation of the Blackpool seafront, a six-year project which saw the creation of six new headlands, the development of the sweeping Spanish steps leading to the beach, the c2,200 square metre ‘Comedy Carpet’ opposite Blackpool Tower, and the remodeling of the Blackpool Promenade. Other exciting regeneration projects include a new state of the art conference centre that will directly link to the refurbished Empress Ballroom and Opera House in the Winter Gardens and opens in April 2019; the extension to the tramway connecting North Station to the Promenade linking shops, hotels and attractions; an extension to the Houndshill Shopping Centre with a new cinema with IMAX screen; and major investment in enhancing the town centre’s public realm. Find the B/Side is a positive and confident message about everyday culture in Blackpool from opera to knitting, carnivals to light art, from the architecture to fish & chips. It’s the bonus track — the alternative, hip, experimental and for some the lesser known, unexpected Blackpool that excites, engages and inspires. Find out more at cultureblackpool and follow the campaign on Facebook and Twitter.